Learn how to machine quilt all your own projects and become the confident quilter you long to be. You’ll practice free-motion quilting with and without using patterns and also work on your “stitch-in-the-ditch” quilting. 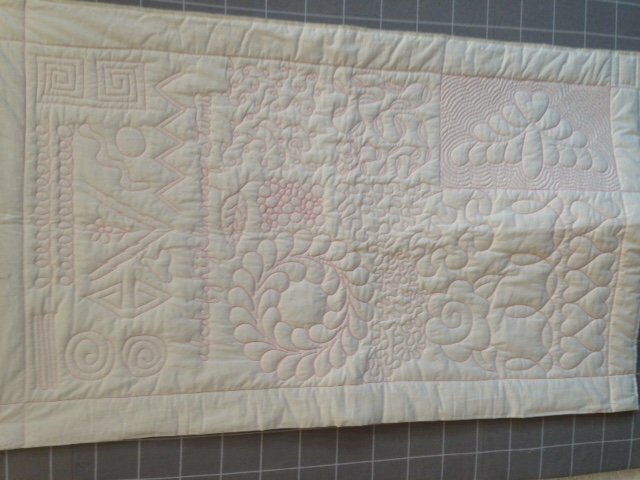 Here are all the tips and hints to help you perfect your free-motion quilting! Sewing machine in good working order. Dust out bobbin case or oil before class if recommended by your machine manufacturer. Bring your instruction book, if available, and ALL pieces and parts for your machine. Extension to sewing surface if you have one. Single hole throat plate—optional, bring if you have one. Marking pen--I like the wash-out blue type, but anything that shows up on your fabric is OK.
Two very different colors of machine thread. One thread will be in the bobbin and one on top. Examples: red & black; orange & green; etc. This is so that we can watch your machines tension. Avoid the same thread color as your fabric color. The same brand of each is good. * Cutting mats will be supplied by the shop. Note: Because this is a full day class, there will be a break for lunch. You may bring your own lunch or we will place an order from the Lyons Dairy Bar (they have great sandwiches!). Please bring cash if you would like us to order for you. Class Policy - Please Read! You are not officially enrolled in a class until you pay in full. You may call and pay by credit card. For a full refund you must cancel your spot in a class 72 hours in advance of the first class session. If you cancel within the 72 hours, you will only be refunded with store credit if we are able to refill your spot. If you are unable to pick up a physical copy of the supply list, please download it off of our website www.lyonsquilting.com under classes and click on the class you are taking. Supply list is under the description. Register by phone or in person; no emails please!